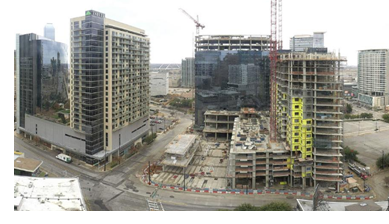 ​​ DALLAS – The 22-story office tower under construction at Field St. and Cedar Springs Rd. near Uptown recently reached its uppermost point but without a signature tree shown in the picture. The tower totaling 417,000 sf of office space is part of the 800,000-sf, Union Dallas mixed-use development. The office tower is more than 50 percent leased to tenants, including Akin Gump, Primoris Services Corp., Streetlights Residential, Weaver, and others. Along with the tower, The Union Dallas also includes a 31-story apartment tower, retail and restaurant space, a park-like plaza, and a 60,000-sf Tom Thumb grocery store. Check out​ DFW Multifamily, Office, and Retail Market Research.